Looking for a great weekend read? Meggan Connor’s Highland Deception drew me in like the scraped mountains and wistful lochs of Northern Scotland and held me captive to the last page. Identical twins, Kenneth the outlaw and Malcolm the laird trade places on Malcolm’s deathbed for the good of the MacKay clan. The challenge for the proxy is to fit into the very mold he despises and fool his kin, his mistress and his wife Isobel. The late laird had not been attracted to his lady wife, but Kenneth is. He must keep his attraction hidden if he is to pass for his brother. Laying with Lady Isobel could very well mean his life. Both Kenneth (as Malcolm) and Isobel are deliciously tortured because lust and love are never as powerful as when you can’t have what you want. It’s a brocade of courage and love, woven tightly with the thread of lies. 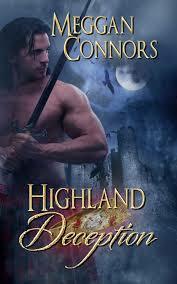 Highland Deception is the second in Meggan Connor’s Highland series. I like the unique series premise which follows a fated family ring and the unlikely love matches it spawns. This match is set in the Eve of the Great Highland Migration (1725). I read it in a day — couldn’t put it down. Am now going to get the prequel, Highland Sons.